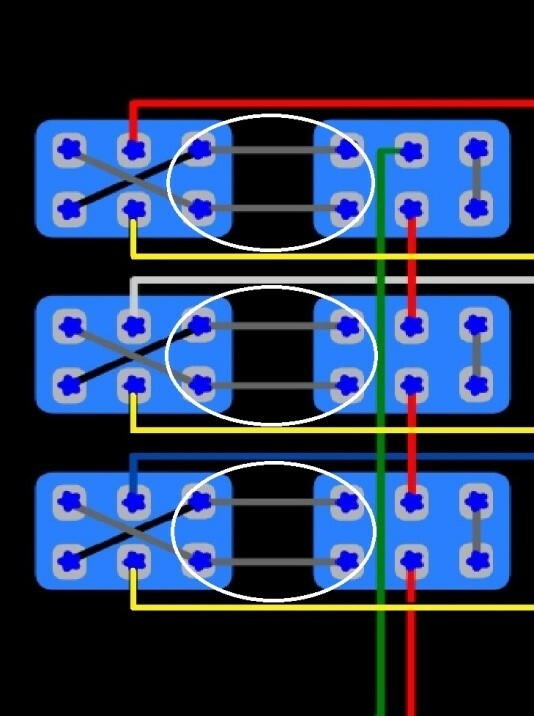 I have been asked by a member of this forum about wiring, and suggest a wiring tutorial. 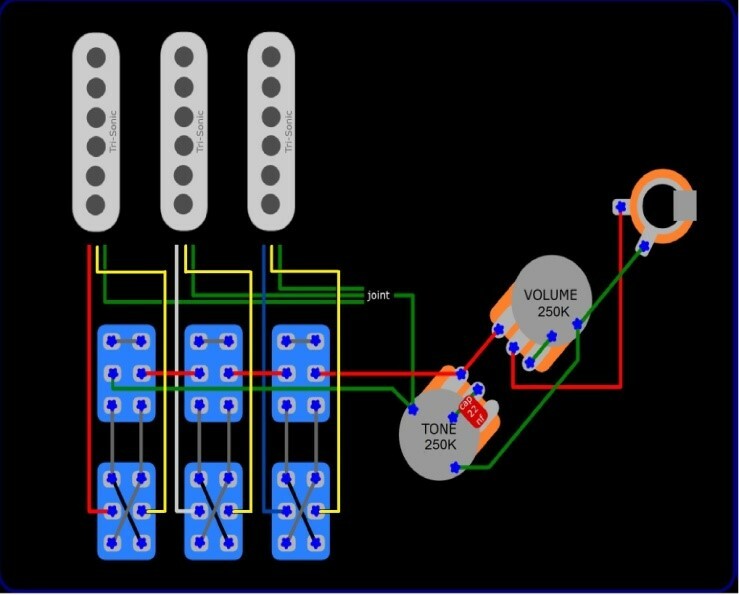 For those who don't understand it, or have trouble reading electronic diagram I'm going to attempt to break down and show picture by picture process to wiring an RS guitar. Here below is a wiring diagram of a typical Brian May circuit, the pots should be 220k NOT 500k. 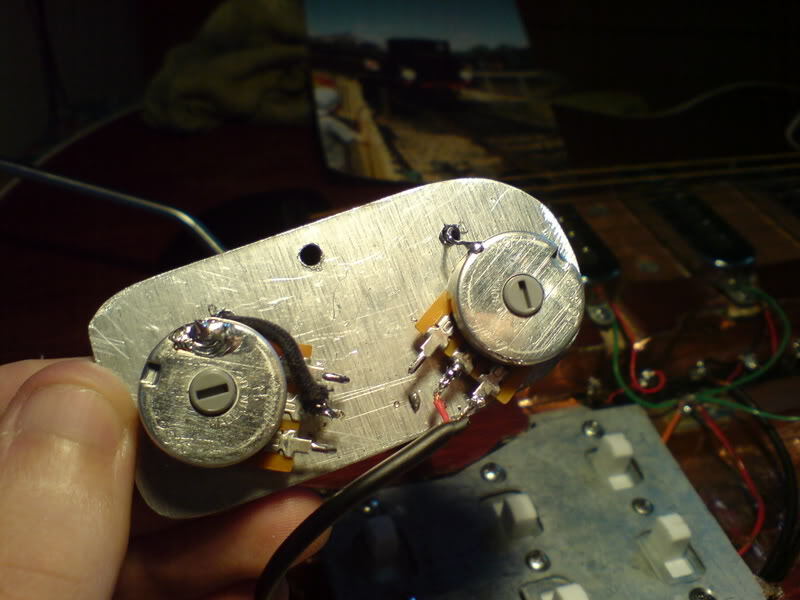 To begin with I will start with switches, as I feel this is the most complex part.What I first do is to attach the switches to the control plates as to me it makes them easier to work on. 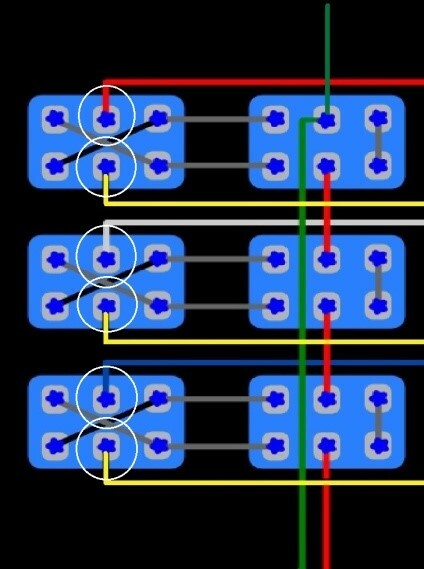 Before soldering any wires on to the terminals of the switches I tin them, this basically means applying solder to these tags as tinning the wire is not enough and will not just stick to the shiny surface of the terminal. 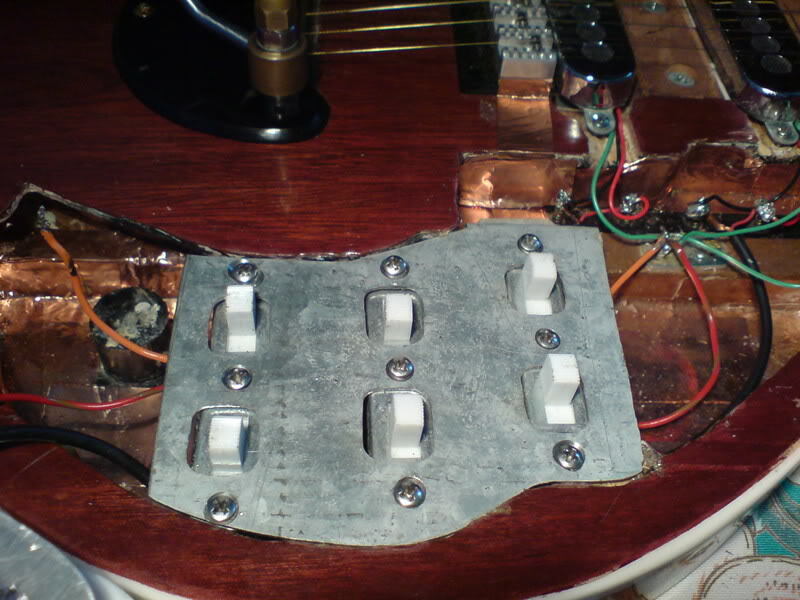 After this has been done you can now start soldering wires on. 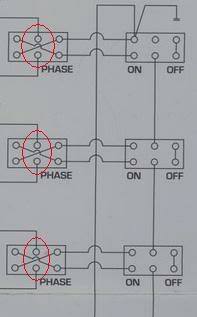 This is the section what we are going to do first which are the switches. This is the diagram below what we will follow face of the terminal. 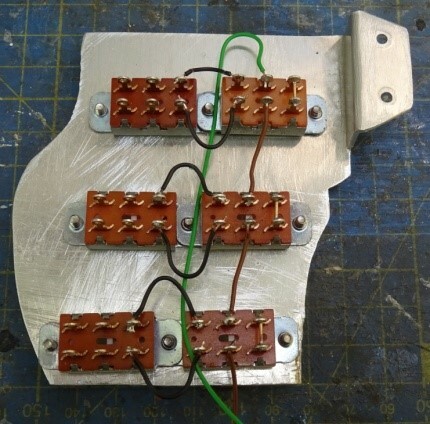 This basically an upside down view of the pick-guard / switch plate your working on, so my tip is to work the same way as your looking at the diagram so you don't get them confused and the wrong way up. After taping the ends in you then tap the middle in to the slot, the reason for the super glue on the end is to stop the end of the pop up when happing the middle down. 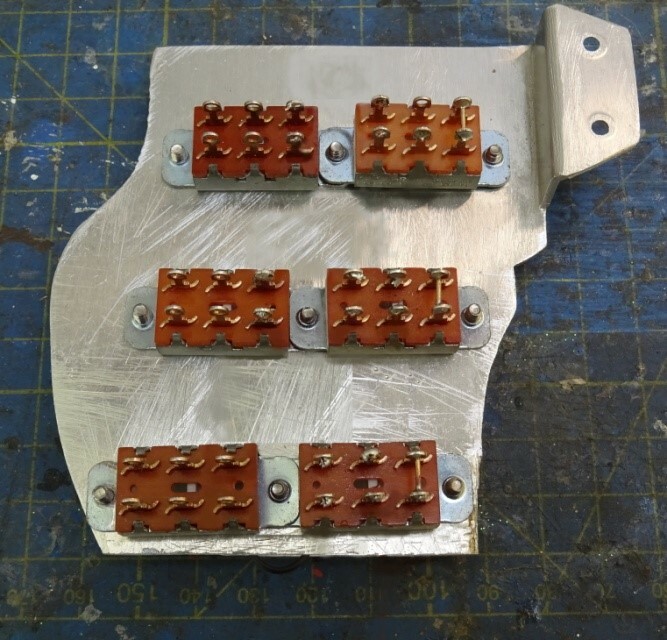 The first part of the wiring I will do is put the links in the on off switches, this is basically just a piece of metal wire to connect the two terminals. I have circled the part we are doing and taken a picture of the area so it is clear. I will continue to work on the On / Off switches, The next part I will do, is to link the middle terminals up, you will need 3 cm of wire. 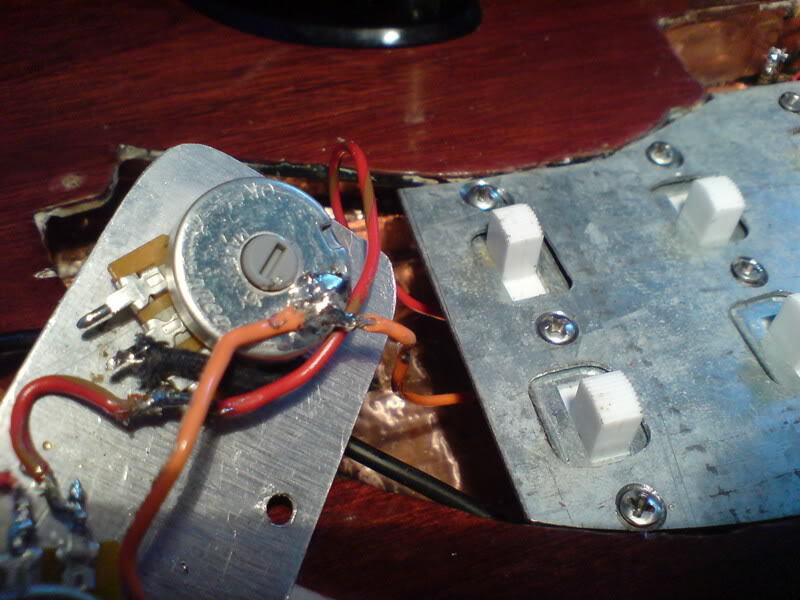 When you get to the Bridge pickup On / Off switch, a wire will come off the middle terminal to go to the Tone pot this is about 10 cm long. 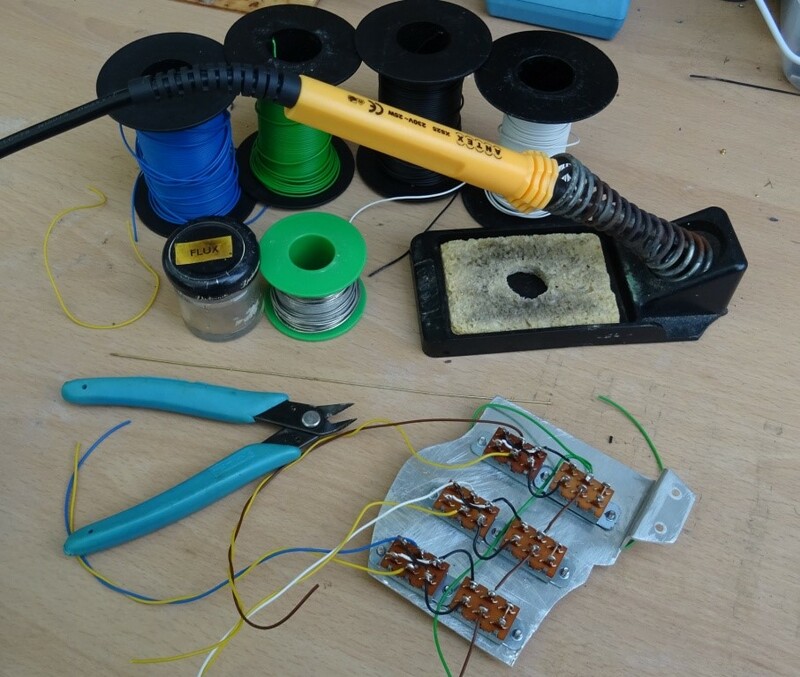 To solder the wire, you tin the end, place the soldering iron on the Tag / terminal of the switch to heat up the solder which is on the terminal, you then place the wire through the hole of the terminal, whilst still keeping the iron the point you want to solder. 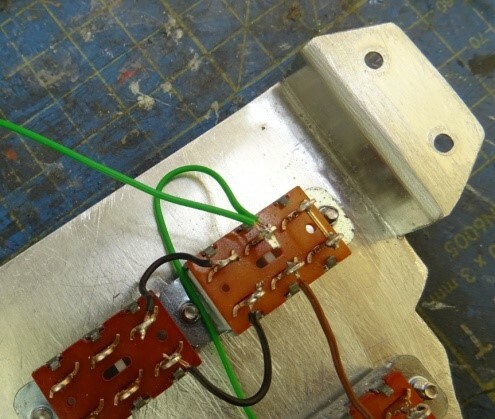 Leave it there for 2 - 3 seconds so the solder bonds. Leaved it for about 4 - 5 seconds to let the solder cool, you will know when as it will go slightly dull. This should be the first wire on and now you repeat this process. 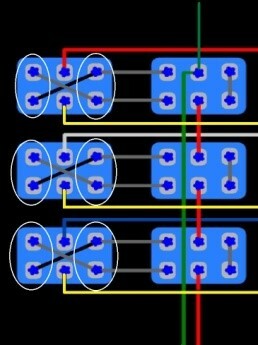 Next part is slightly different, you may want to label some of the wires so you know where they go. In this section you will have to link the On / Off switch to the Phase switch, These are both end terminals. On the Neck On / Off switch, the end terminal there are 2 other wires coming off this terminal. 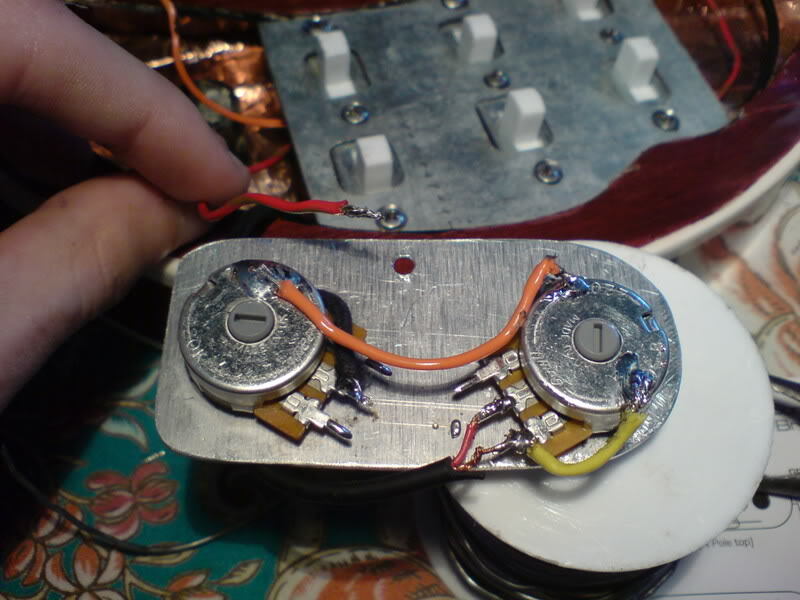 One is the link to the phase switch, the second goes to the bottom of the Tone pot, and the third goes to ground. 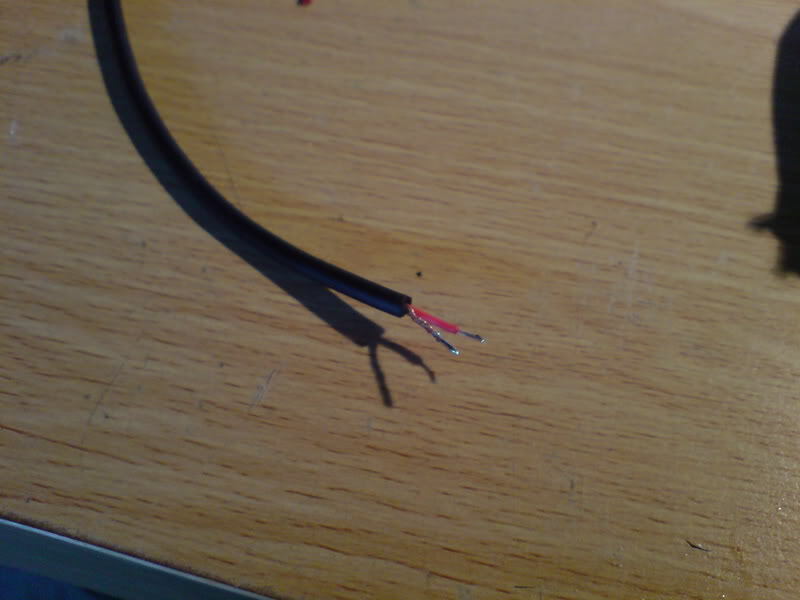 The link wires you will need about 6x - 2 cm of wire. 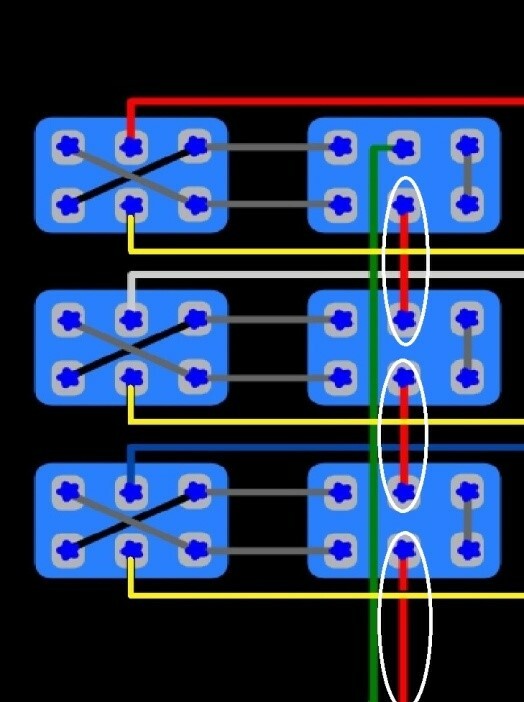 The first picture will just show the link wires, the second picture is the extra 2 earth / ground wires, laid out the same as the diagram. 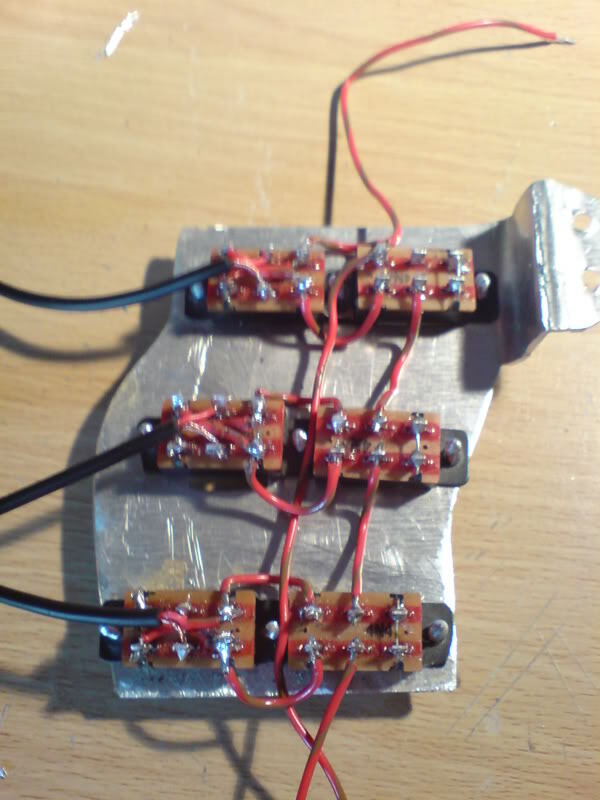 This next part is a little more tricky but we are almost there for the switches. We have now finished with the On / Off switches and we moved on to the Phase switches. The next part is as I say tricky, you don't have a lot of room, basically you need to go from end terminal to the other end, but you have to cross over to the opposite side. You will need 6 x pieces of wire, at around 2 cm in length. TIP - When soldering I find it easier to attach let side terminal as there are no extra wires on this terminal so it will be held there whilst you solder the more difficult end. On the original RS guitar, in front of the pickups are 6 Brass posts / screws sticking out of the wood. 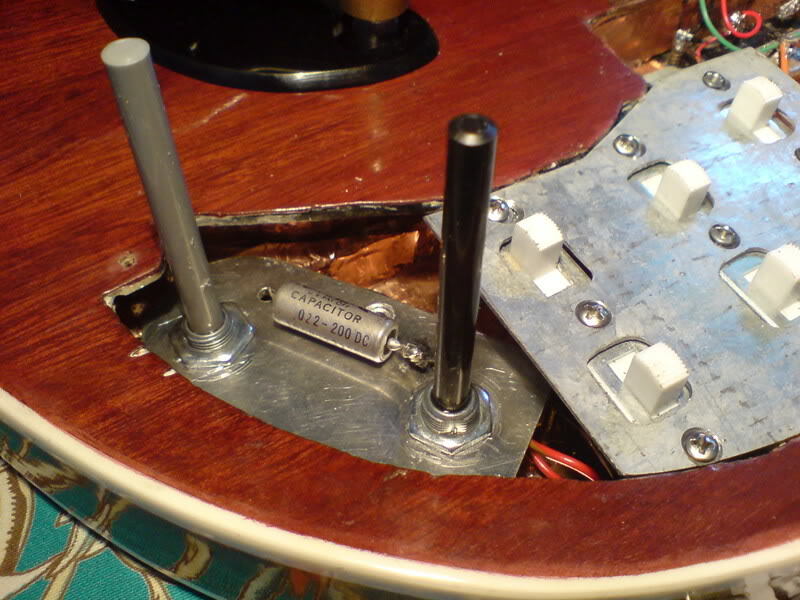 I think we all know that Brian changes where his reversed pickup is from Bridge to middle hence why some people are confused. 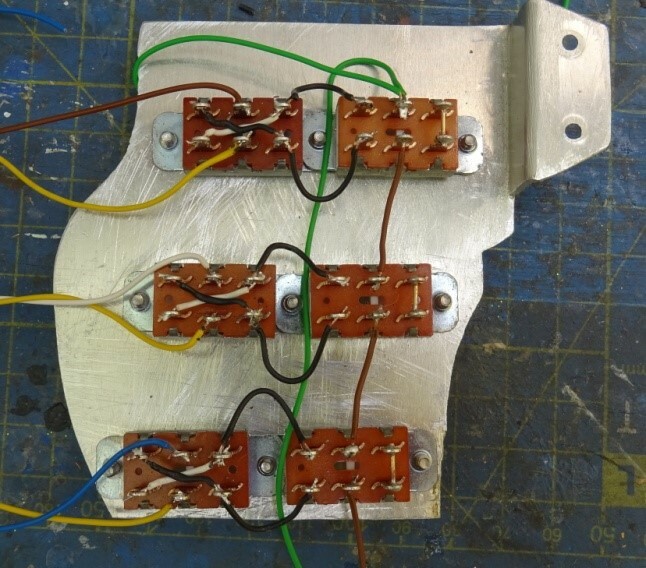 These 6 posts are called Polarity posts, there are wires leading from the middle terminal on the phase switch to these brass posts. 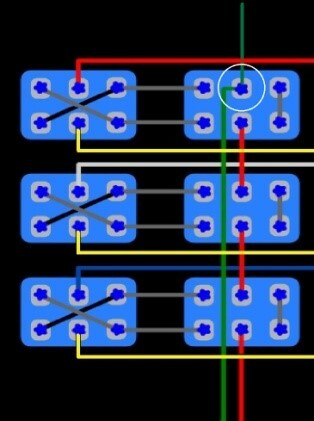 There is a Positive and Negative so I recommend you use 2 different coloured wires to avoid confusion. 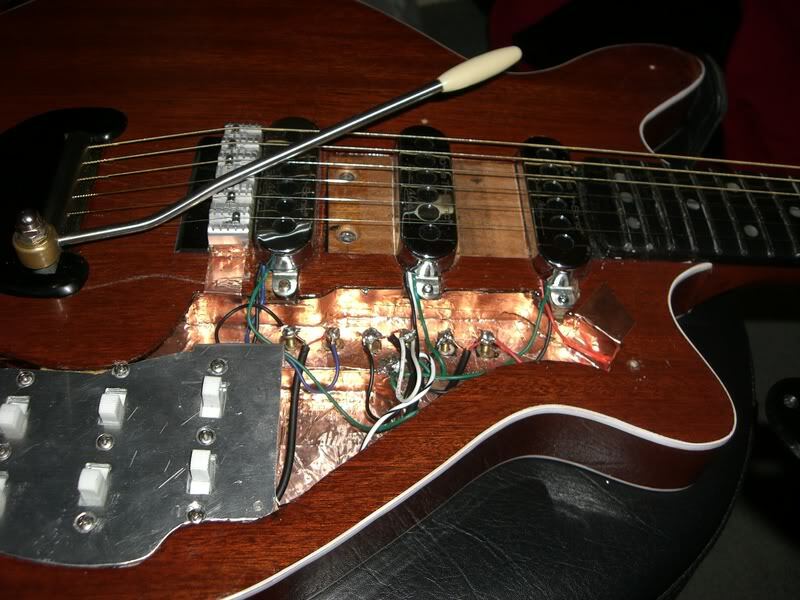 The Pickups are wired to these brass posts also, this means instead of having to take the switch plate off and change the wires over, all he has to do is unsolder the pickup from its Brass post and swap them over avoiding the hassle of taking plates out. You can include these if you would like, or you can just go straight to the switch. 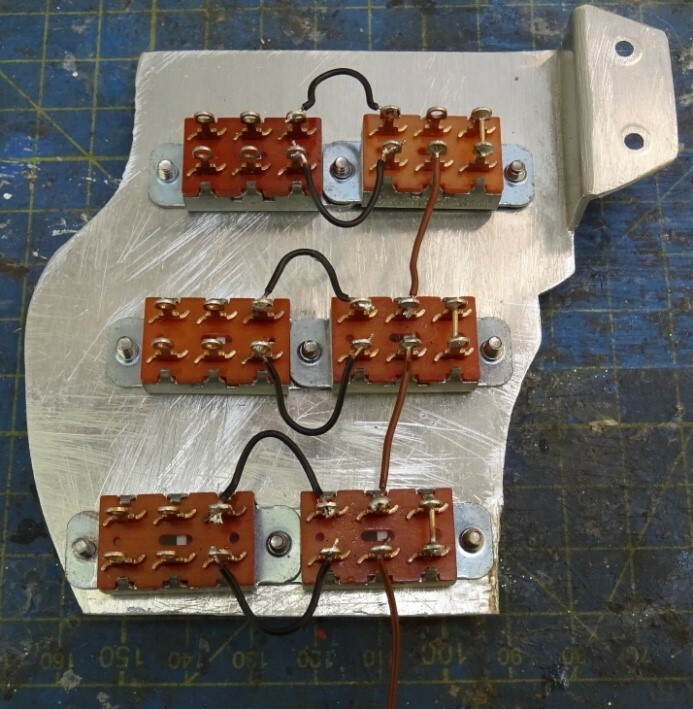 These are the Brass Polarity Posts on my latest Build, You have to be careful with the copper shielding tape so it doesn't make contact with the posts, cause you won't get any sound out of your guitar otherwise. 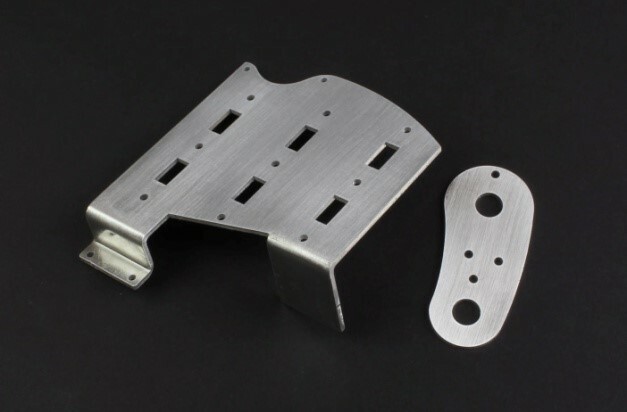 This is a picture of the same part of the guitar, on the Original guitar. 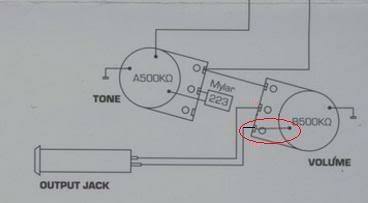 I've labelled the parts where some of the wires go to, just to help you out. 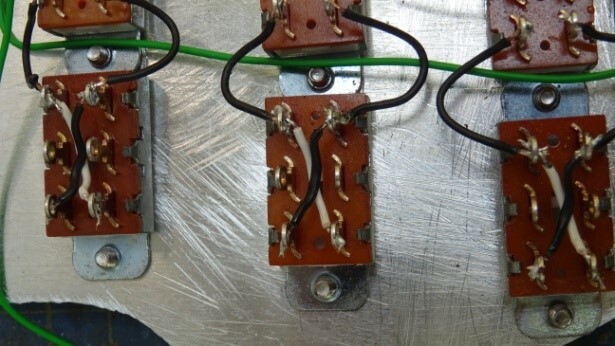 The second part of this wiring tutorial I will be covering how to wire the Pots up to switches. You need the same equipment above, and you will need Wire 2x Long Shaft and 220K Log B pots. You can order the pots from Maplin in the UK. 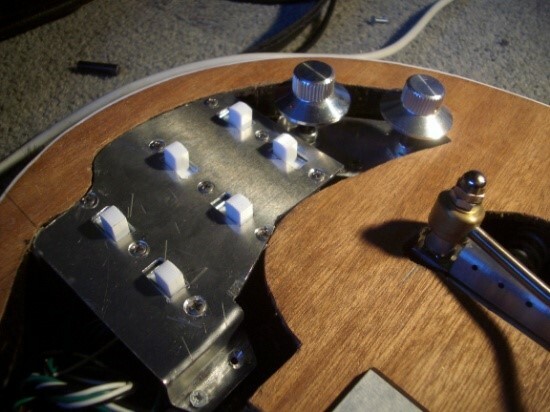 Firstly we will put the Switch Plate in to the guitar and wire up the switches to the pickups. 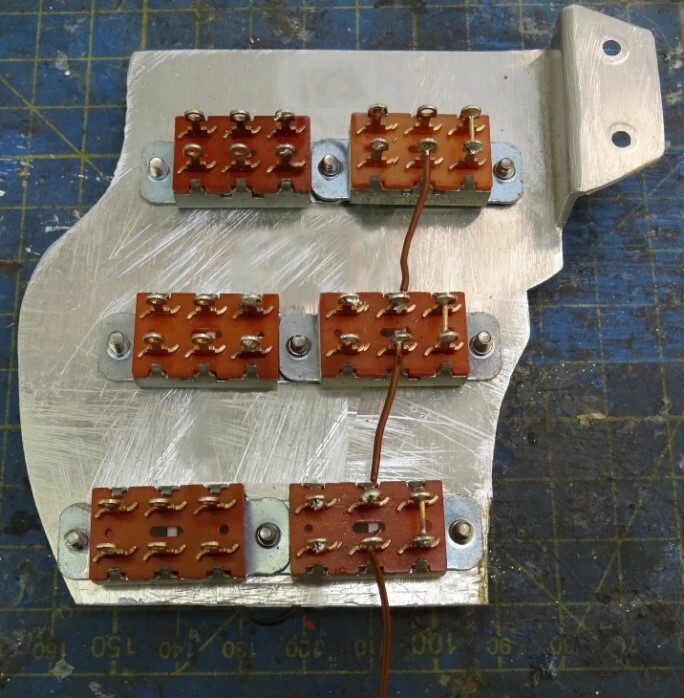 This is the switch plate now in place with the earth wires connect as per Brian's, as you can see the bridge is earthed with copper tape which goes in to the chamber. This is a Must! The red / brown striped cable coming from the switches towards the 3 green wires is the earth wire. 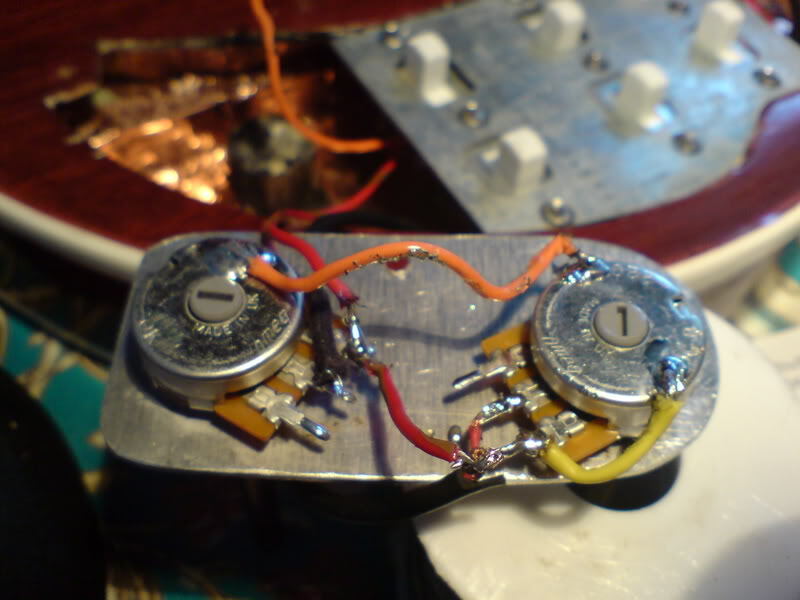 There is also an Orange wire coming from this point that also goes back to earth , which in this case is the base of the Tone pot. 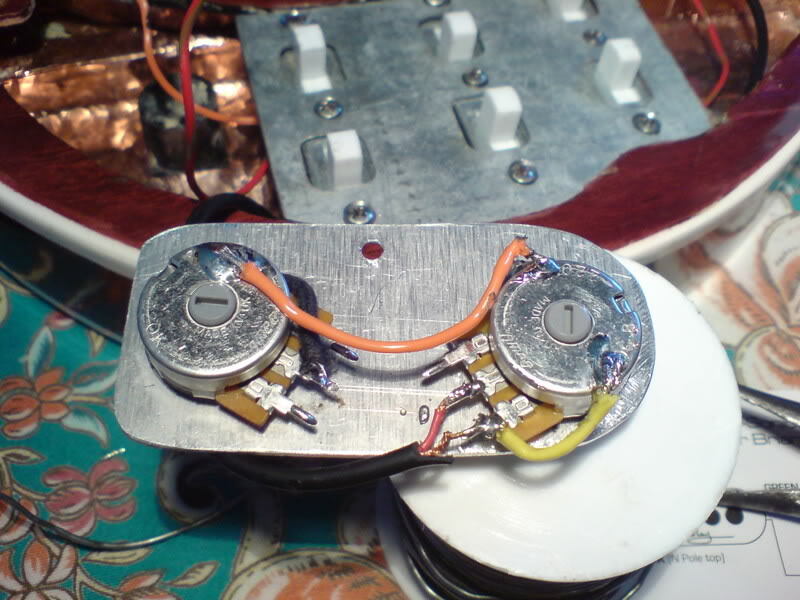 On the left of the picture, top to bottom you will see the Orange Earth Wire, The Red and Brown wire which goes to the tone pot, and a Back Wire, which goes to the volume pot from the Jack, It has 2 wires inside the black wire. This is a simple Diagram of the Pots and Jack plug. 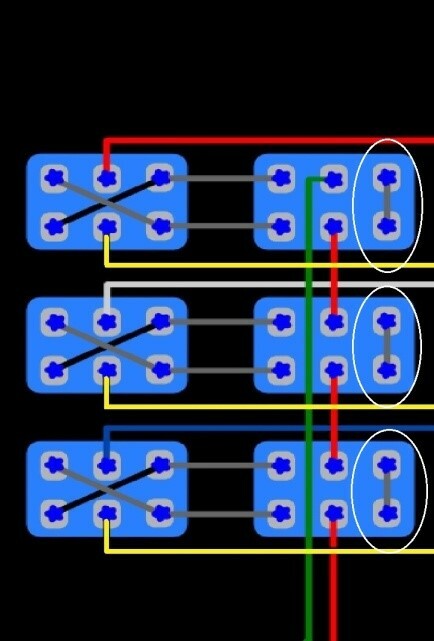 The two wires at the top of the Diagram, the one on the left is the Earth wire, The Orange on in the Picture above, and the one on the Right is the Red and Brown Wire, which comes from the Phase switches. 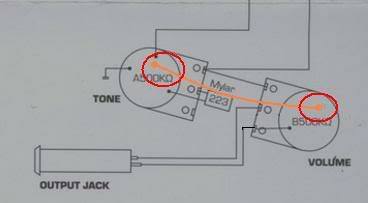 Also on this diagram the Pots are 500k ones, which they use in the BMG's or Burns, On the original Guitar the pots are 220k Log B. 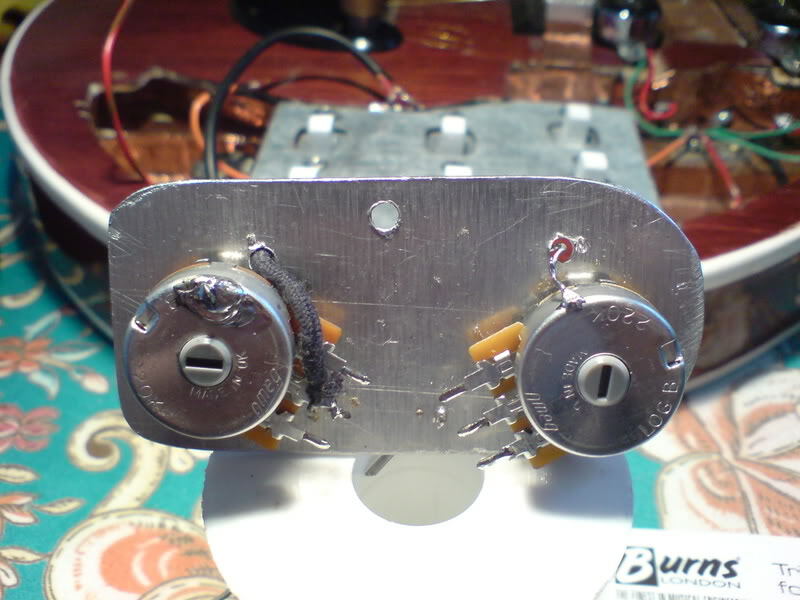 This is how it should look to begin with, Tone pot on the right, volume pot on the left. This will be reversed when the plate is turned over. 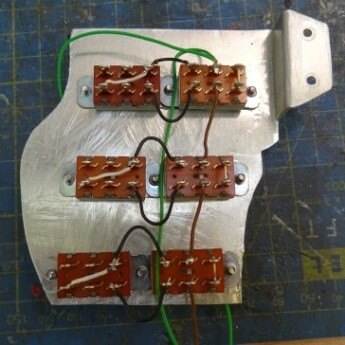 This first step will concentrate on Attaching the Capacitor to the middle Solder Tag of the tone pot, with the other being soldered to the Bottom of the Volume pot. On the Diagram above, it shows it soldered to the bottom of the Tone Pot, you can attach it to either one, as they are both Earthed. 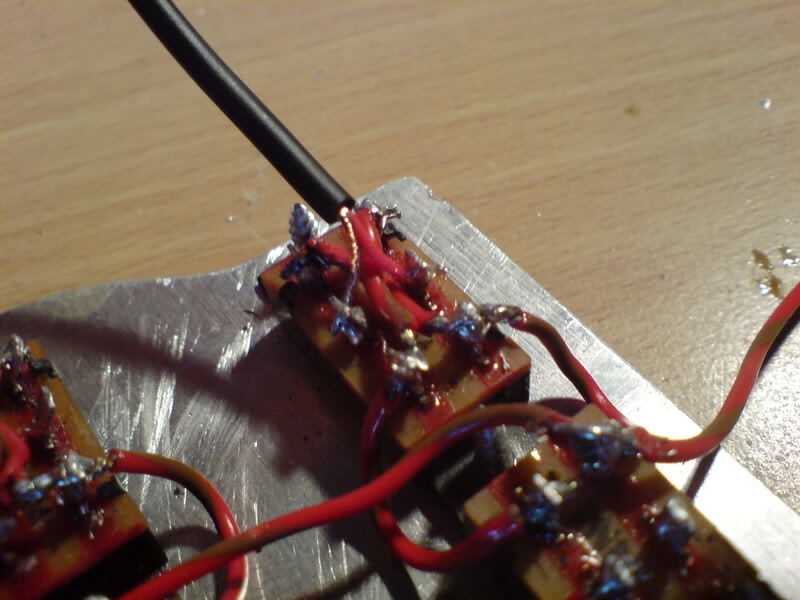 As before tin the solder tags, and tin the end of the wire your soldering. 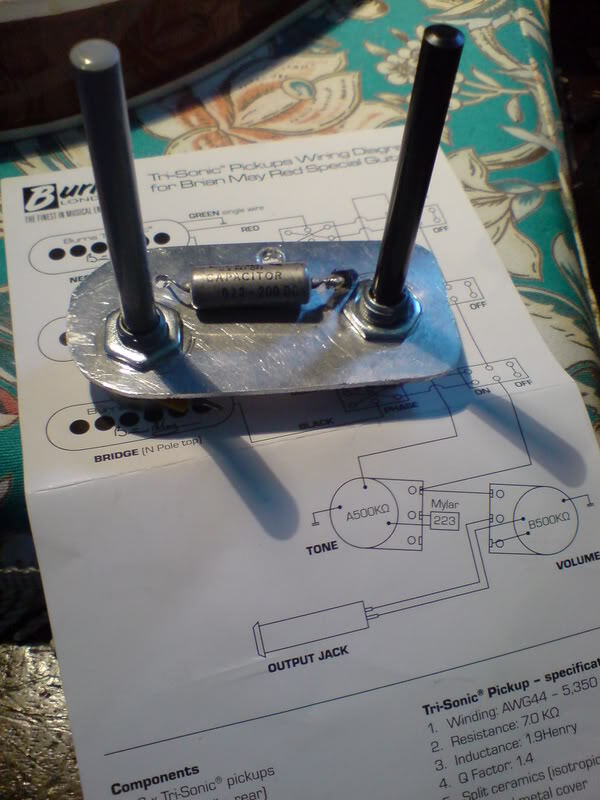 The next part I shall do is attach the 2 wires from the Jack Socket to the Volume pot, With this 2 different colour wires would be best. 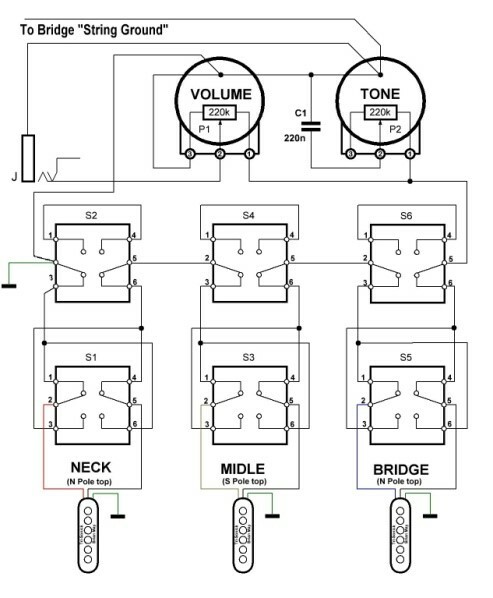 The Live wire, which on this occasion is Red, will go to the middle terminal on the Volume control, the earth wire from the jack socket goes to the right terminal of the middle. Next will be a small simple link from the right Terminal of the Volume to the base of the Volume pot. Next will be another simple link from the base of the Volume pot to the Tone Pot, this ensures that both pots are earthed, you can see I started doing this in the above photo, with the Orange wire on the opposite side to the Yellow wire. 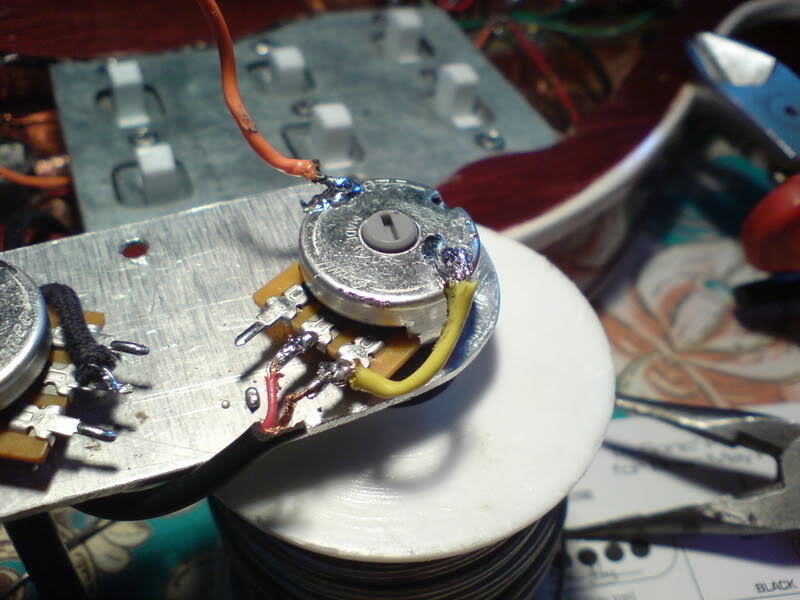 After earthing the 2 pots, I then link the Tone pot up to the Red and Brown striped wire coming from the phase switch, this wire goes to the top terminal on the Tone Pot. 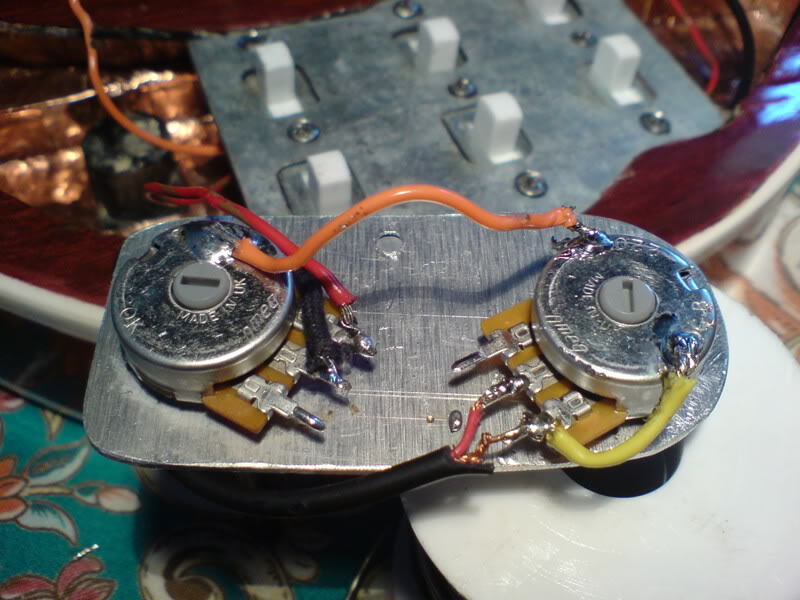 Next you will need a wire coming off the terminal of the tone pot you have just soldered to, and run it to the opposite terminal on the volume, there should only be one terminal left if you have done this correctly! Job complete, all is left is to shorten the Shafts, and put the pick guard back in place, and then the knobs! © 2009 - 2017 Red Special Library. All rights reserved.